For many years, astronomers had a simple view of our Milky Way’s bulge as a quiescent place composed of old stars, the earliest homesteaders of our galaxy. A new analysis of about 10,000 normal Sun-like stars in the bulge reveals that our galaxy’s hub is a dynamic environment of variously aged stars zipping around at different speeds, like travelers bustling about a busy airport. This conclusion is based on nine years’ worth of archival data from the Hubble Space Telescope. The faster-moving and later-generation stars may have arrived at the hub through our Milky Way cannibalizing smaller galaxies. They mingle with a different population of older, slowing-moving stars. 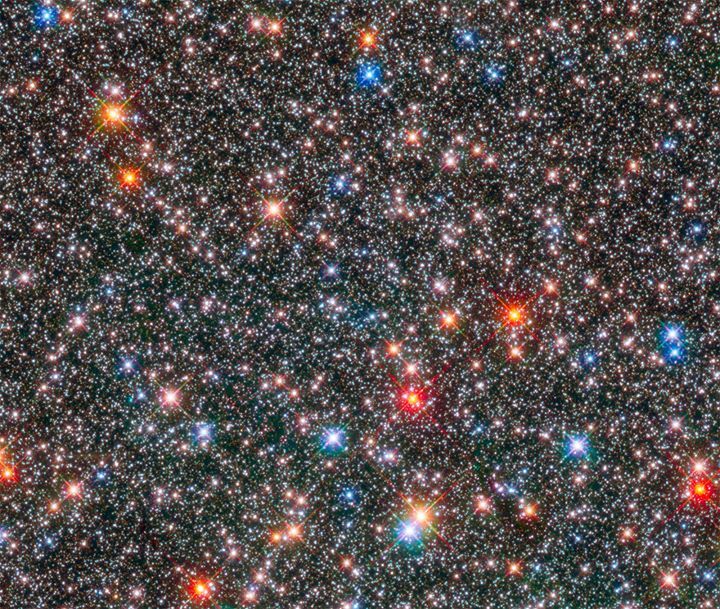 Currently, only Hubble has sharp enough resolution to simultaneously measure the motions of thousands of Sun-like stars at the bulge's distance from Earth. I find the different colors very interesting. Of course I find the blue stars most interesting. Obviously the colors are exaggerated. The question is, just how exaggerated are they? Are the blue stars really at least as blue as early A-type stars like Sirius and Vega? Are some of them even bluer than Sirius and Vega, like Regulus? Or are the bluest of them just a little bluer than the Sun, like Procyon? More specifically, how hot are the blue-looking stars? Are they 9,000K or hotter? Or perhaps 6,000K or cooler? Maybe some of the blue-looking stars are just less dust-reddened than most other stars in the picture? Perhaps they are really G-type stars like the Sun? Sirius, Vega and Regulus are all young stars, younger than a billion years. Are there main sequence A- and B-type stars in the Milky Way's bulge? Perhaps the blue color in some stars doesn't designate "true color" (or temperature) at all, but chemical composition? So that the "blue" stars just have a particular chemical makeup? In which case they may be young-ish, but usually not young enough to belong to spectral classes A and B - like, say, three billion years? On the other hand, is it possible that the blue stars are blue because they are terrifically old extremely metal-poor horizontal branch stars, like the circa 12 billion-year-old brightish blue evolved stars found in many globulars? After watching last night’s Nova, and seeing updated information regarding the motion of the stars near its center, it made me curious about the orbits of stars we’ve not had the time to chart. Pointed out was the necessity to have a black hole at the galactic center to maintain a galaxy’s overall shape but the question of star mixing in the bulge is still a very interesting topic needing observation over much time. Ann wrote: Perhaps the blue color in some stars doesn't designate "true color" (or temperature) at all, but chemical composition? Star color is always a good indicator of temperature unless there is intervening dust or the star has a carbon atmosphere. Compositional differences show up in close study of emission and absorption lines, but not in apparent color. You are right of course, Chris. What I meant to do was to ask if the blue color of some stars might just be "mapped color" to show that these stars have a certain chemical composition. In other words, is it possible that the the color of the stars in this picture might have nothing to do with the temperature of the stars, but showed chemical composition instead? Ann wrote: What I meant to do was to ask if the blue color of some stars might just be "mapped color" to show that these stars have a certain chemical composition. In other words, is it possible that the the color of the stars in this picture might have nothing to do with the temperature of the stars, but showed chemical composition instead? No, it doesn't look like it. Two near IR channels are mapped to red, another near IR channel is mapped to green, and the visible range is mapped to blue. Nothing there is going to be particularly indicative of composition. This image doesn't appear in the paper itself. I think it's just used for the press release as an example of the HST's resolution when imaging the galactic bulge. The research itself uses HST data to derive proper motion of bulge stars, and ground-based spectroscopy to determine composition (metallicity) of those stars. Changing the subject to the article's title, why call this and like studies "Archeology"? Were any archeologists involved? I certainly doubt it. Archaeology, or archeology, is the study of human activity through the recovery and analysis of material culture. The archaeological record consists of artifacts, architecture, biofacts or ecofacts, and cultural landscapes. Archaeology can be considered both a social science and a branch of the humanities. As everyone should be able to agree that no human activity was involved in the formation of our galaxy's central bulge, I think 'archeology' is poor word choice for such topics. [c]A part of the bulge of the Milky Way. [c]The center of globular cluster Omega Centauri. The bulge of the Milky Way looks interestingly similar to the center of Omega Centauri in these two Hubble pictures, although there are also obvious differences. 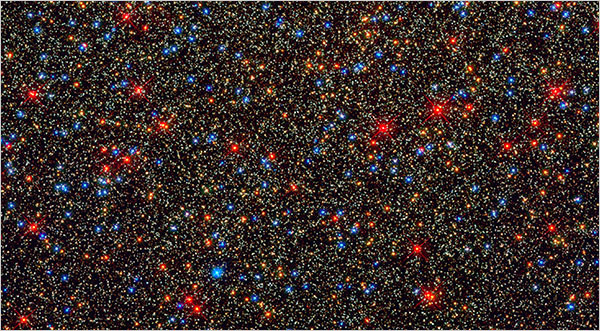 One difference is that the blue stars of Omega Centauri (which are age-old, evolved stars of spectral class B) all belong to the horizontal branch and are all of more or less the same brightness. (That one bright blue star at about 7 o'clock is an oddity of some sort.) Also note that all the brightest stars in Omega Centauri are very red, since they are all very large, cool asymptotic giant branch stars on the verge of sloughing off their outer atmospheres and turning into white dwarfs. In the bulge of the Milky Way, the blue stars are not necessarily all horizontal branch stars, since it is at least possible that some may be main sequence stars. Therefore they are not necessarily all equally bright. And since the red giant stars of the bulge of the Milky Way may not be equally old either, it is possible that there may be bright red and yellow stars there that are not asymptotic branch stars. Of course the two pictures are not directly comparable, since it is not probable that the same filters were used for both of them. BDanielMayfield wrote: Changing the subject to the article's title, why call this and like studies "Archeology"? Were any archeologists involved? I certainly doubt it. I think it was a metaphor... they're not trying to say, nor is it likely to be interpreted as having anything to do with people. The stars in this case are the people in the metaphor. I clearly recall Jean-Luc Picard digging up non-human artifacts in the company of a charming and slightly villainous archaeologist, though. Picard called himself an amateur archaeologist as he showed off his collection of artifacts from alien civilizations.